USA’s Camden Pulkinen performs his Short Program at the 2019 World Junior Figure Skating Championships. 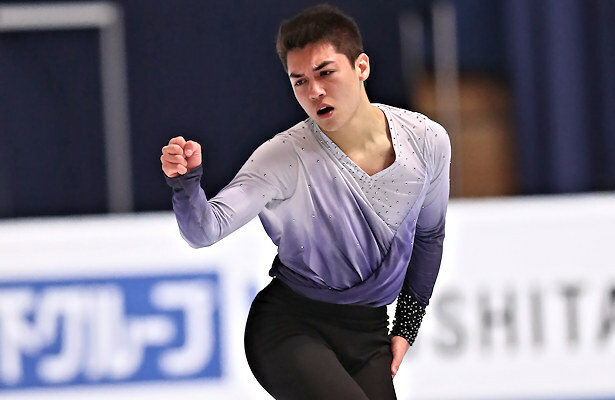 The 2019 World Junior Figure Skating Championships kicked off with the Men’s Short Program in Zagreb, Croatia, on March 6. USA’s Camden Pulkinen lead the men in what was an exciting event, followed closely by teammate Tomoki Hiwatashi. Daniel Grassl of Italy is in a very close third while Russia’s Petr Gumennik is less than a point behind in fourth. With many good performances and new season bests, there are only five points separating the top 10 men. Back to true form, Pulkinen pulled of a strong and expressive routine to “Oblivion” which had good flow and deep edges. The JGP Austria champion landed a solid triple Lutz-triple toe and triple Axel, but received an edge call on his triple flip. He left a few grades of execution (GOE) on the table with his flying camel spin, but otherwise earned a level four on all other spins, as well as his footwork, to score season’s best of 82.41. The 18-year-old from Colorado Springs was very happy with the result and how he skated. Having competed at this event before (sixth last year), Pulkinen knew what to expect and it came as no surprise to see the top 10 give strong performances. When asked what he would like to see changed in the ISU rules regarding the Junior Short Program, he said he would like to see a choreographed spin. “I think that would be really fun and different,” said Pulkinen. “A good addition. Hiwatashi showed determination and confidence, cleanly landing a triple Axel, triple flip, and triple Lutz-triple toe in his routine to “Cry Me a River.” The 2018 Inge Solar Memorial bronze medalist earned a level 4 on his dynamic spins while his footwork was a level 3. He finished second with a season’s best of 81.50. Regarding his opinion on any rule changes for the Junior Short Program, Hiwatashi actually appreciates having a limit for jumps so that the skaters can be looked at in terms of the whole package. The U.S. national pewter medalist knew all the skaters were going to be good going into the event. Grassl held on to the landing of his opening triple Axel, but landed a solid triple flip and triple Lutz-triple toe in his flowing routine to “Rain, In Your Black Eyes.” The Italian national champion, coached by Lorenzo Magri, displayed strong level 4 footwork and spins throughout and finished third with 81.19 points. The 2018 Inge Solar Memorial champion was also happy with his performance, particularly since it’s his debut at this event and he felt excited and nervous. “I made a little mistake on triple Axel, but I hope in the free program it will be better,” said the 16 year-old from Merano. His take on adding or changing rules for the Junior Short Program would be to add a quad and a choreography sequence. Smiling throughout his routine to “Czardas,” Gumennik showed interesting level 4 spins and landed a solid triple flip and an impressive triple Lutz-triple loop. However, the landing on his opening triple Axel was a bit forward and the 2018-19 Junior Grand Prix (JGP) Final silver medalist finished fourth with a new season’s best of 80.33. “Not everyone does a triple Lutz-triple loop in a short program,” noted the Russian national silver medalist. “I think it gave me more points. You also have to make all non-jumping elements level 4, but I never got it in a SP before.” His footwork was a level 3. USA’s Alexei Krasnozhon, who suffered an injury at this event last year, had a tight landing on the triple Lutz-triple toe, but showed a strong triple Axel and triple flip in his performance to “Dancing On My Own.” The 2017-18 JGP Final champion otherwise earned a level four on all other elements to earn a season’s best of 79.98 for fifth place. Skating to “Granada,” Roman Savosin of Russia received an edge call on his triple flip, but landed a good triple Axel and triple Lutz-triple toe. All non-jumping elements were graded a level 4 and the 2018 JGP Cup of Austria bronze medalist sits in sixth with a new season’s best of 78.33. Joseph Phan of Canada put a hand down on his triple Axel in his expressive routine to “Million Eyes” by Loïc Nottet, but managed a solid triple flip and triple Lutz-triple toe for seventh place with a new season’s best of 77.89. France’s Adam Siao Him Fa also scored a new personal best of 77.74 points, and is eighth going into the free skate. The 2018-19 JGP finalist displayed lots of energy in his dramatic routine to music by Two Steps from Hell, but had to fight for the landing on his triple Axel. He otherwise produced a triple Lutz-triple toe and triple flip while earning level 4 on all elements. Artur Danielian of Russia put out an entertaining routine to “Puttin’ On the Ritz” which featured an excellent triple Axel, as well as triple flip and triple Lutz-triple toe. However, he left a few points on the table with his change combination spin and level 2 footwork. Nevertheless, the 2018 Tallinn Trophy junior champion scored a new season’s best of 77.71. Canada’s Stephen Gogolev did what he needed to do to stay near the top going into the free skate, but it wasn’t his best performance. The JGP Final champion had shaky landings on his triple Lutz-triple toe and triple flip, losing GOEs, but his triple Axel was solid. He scored 77.00 points for his routine to “Run Boy Run” by Woodkid to round out the top 10 in his debut at this event. Georgia’s Irakli Mayasuradze is currently 11th (76.46), followed by Japan’s Koshiro Shimada (74.89).